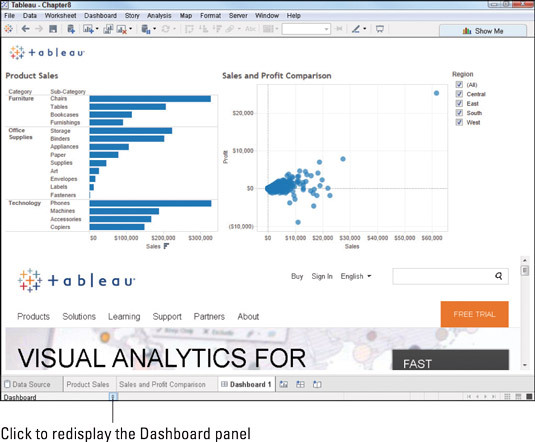 You want your Tableau dashboards to be easy to use whether you only use them yourself or if you share them with other people. In addition to creating an intuitive design for your dashboard, you can do a couple of other things to make your dashboards easier to use. For example, you might want to add a handy quick filter so users can choose what they want to see. When you add a quick filter to a dashboard, you’d probably like it if that filter worked with all the views on the dashboard. That is, when you select something like a Product category using a quick filter, you almost certainly want all the views on that dashboard to reflect your selection. Right-click the quick filter to display its contextual menu. Choose Apply to Worksheets and then select All Using This Data Source. Choose how to apply the quick filter. 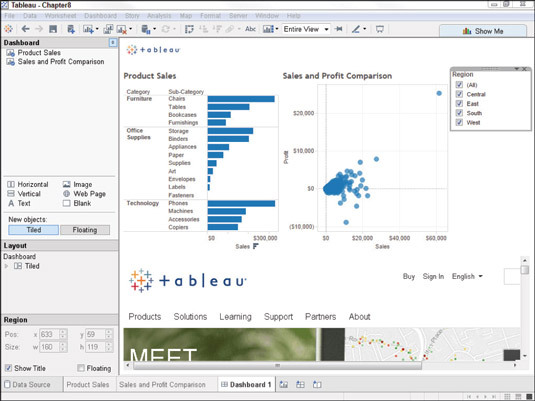 After you’ve created your dashboard, you don’t need to keep the Dashboard panel in view. Not only does the panel use up valuable space, but it’s also likely to be confusing for people who share your workbook. To hide the Dashboard panel, click the double arrows at the right side of the Dashboard Panel title bar. Hide the Dashboard panel to make your dashboard easier to use. Your result should look similar to this. Click the double arrows to once again display the Dashboard panel. 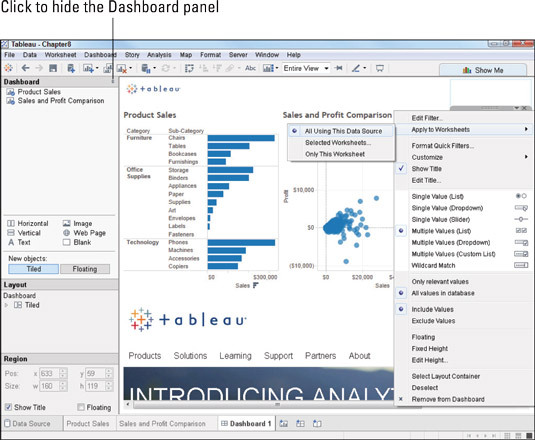 When the Dashboard panel is hidden, its title bar drops down onto the Tableau status bar in the lower left of the window. If you want to see the Dashboard panel again, click the double arrows in the lower left.